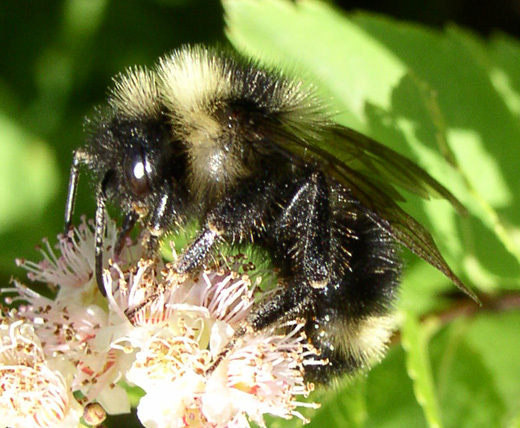 The scientific name for a bumble bee is Bombus, we will have to use this name when talking about different species of bumblebees because some of them don’t have a common name. 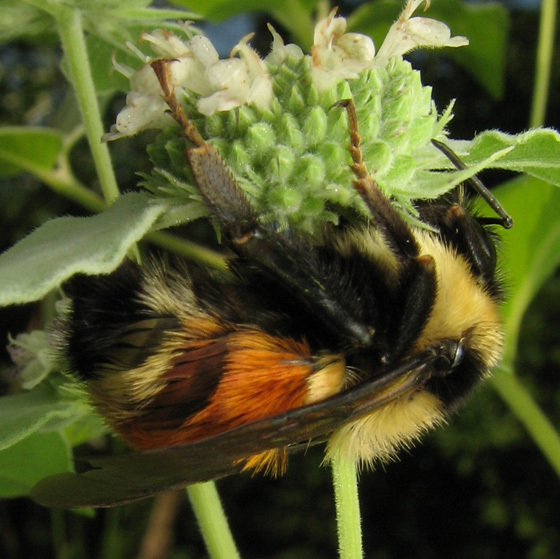 The tricolored bumblebee (Bombus ternarius) is very striking, with a bright band of orange in its abdomen alternating with the white and black of the rest of its body. As I said, it is easy to make mistakes; there are some similarly colored ones, such as the well named red belted bumble bee (Bombus rufocinctus). As if that wasn’t enough there are also a couple of more species with a similar bright orange belt on their abdomens: Bombus huntii and Bombus melanopygus. A very common bumble bee is the impatient bumblebee, Bombus impatiens; I guess that it gets its name for its quick and very active movements, but, please, don’t quote me. 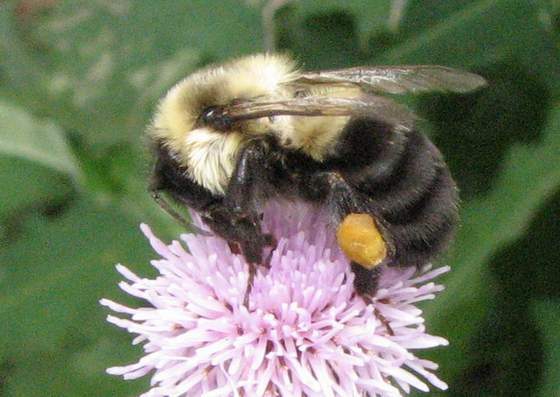 Its other name is common eastern bumble bee, which is self explanatory. If you live in the eastern United States that is the one that you see most often. It is possible to mistake the impatient bumble bee with the brownbelted bumble bee or Bombus griseocollis. Although in this case a reddish touch, visible in some cases, sets it apart. 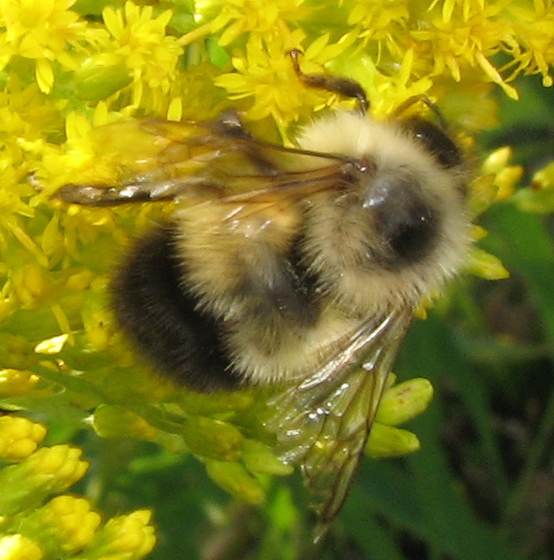 Another one that I find somewhat similar to the last two is the twospotted bumble bee (Bombus bimaculatus). 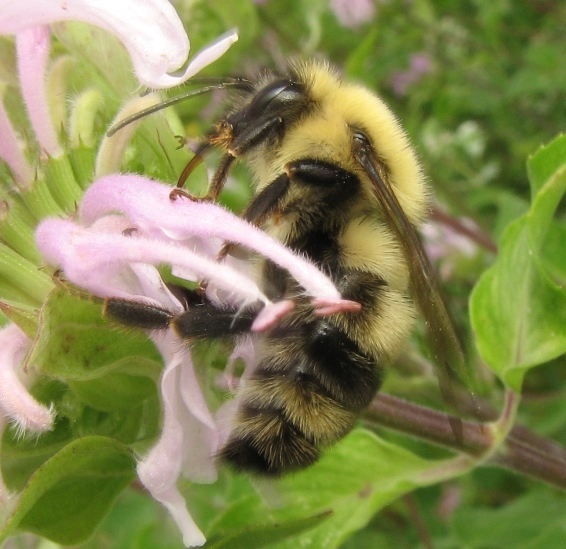 Ironically, the confusing bumble bee (Bombus perplexus) doesn’t look confusing to me. It seems to have more yellow and less black than most of them. Sometimes you just can’t be certain and simply have to guess between two or more species, such as Bombus vagans, perplexus, or sandersoni. This is the case more often than not. 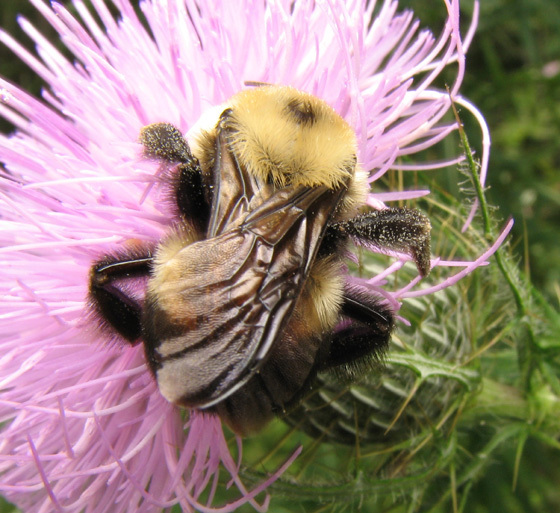 Not all bumble bees are industrious pollen collectors and caretakers of their babies. Some have taken the easy way out. They victimize their relatives, other bumblebees, and lay their eggs on their nests or take possession of their colonies and use the workers of their victims as servants. There are several species of these cuckoos; they get this name because their behavior is so similar to that of cuckoo birds. They are so used to this easy life style that they have lost their pollen baskets and their ability to build nests; on the other hand they have become quite warrior-like to subdue their hosts. They also have become adept at imitating the appearance of some of their victims, making it harder for other bumble bees as well as for human observers to tell the difference. Here are two of these cuckoo bumble bees, the Fernald cuckoo bumblebee (Bombus fernaldae) above left and the lemon cuckoo (Bombus citrinus) right. 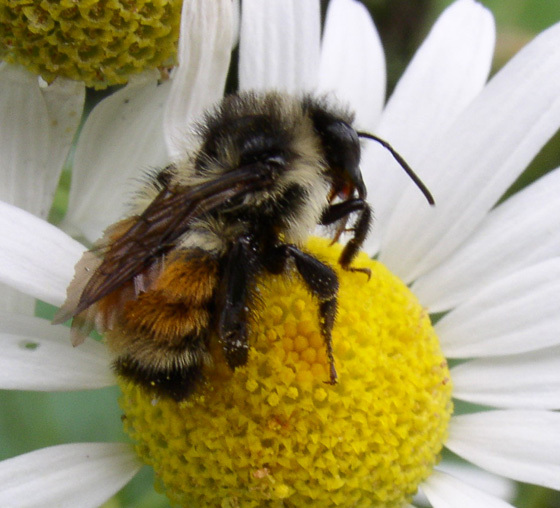 Bumble bees: the pandas of the insect world? 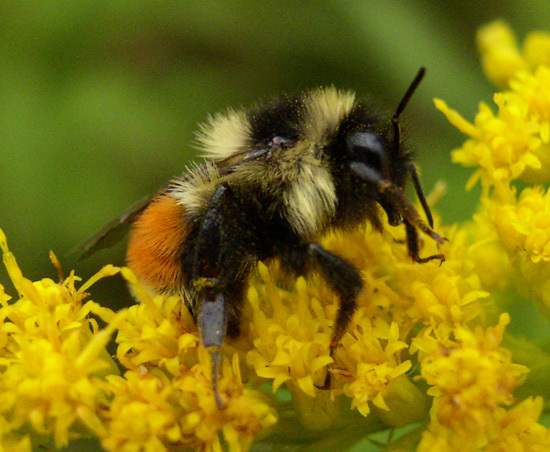 Bumble bees, those fuzzy industrious flying insects, are part of our culture in a number of ways: from Nikolai Rimsky-Korsakov’s “Flight of the Bumble Bee” to cute Halloween costumes, waving antennae and all. Stuffed toy bumble bees are ubiquitous in every nursery and most children libraries seem to carry at least one book about bumblebees. Songs and fairy tales involving bumblebees abound. Bumble bees are plump and furry insects, usually striped black and yellow or black and white and yellow. Some even have some orange to brighten things up a little more. They have two large eyes and, if you look very carefully, you will see three smaller eyes at the top of the head, between the large ones. The mouth has jaws which the females use for some tasks such as kneading wax and building little pots that they use to store pollen and nectar. Insects have three pairs of legs and bumblebees are no exception. The back legs of the females are very peculiar, with a broader, flattened section surrounded by stiff hairs forming a sort of basket; as we will see later on, that is exactly how bumble bees use them. 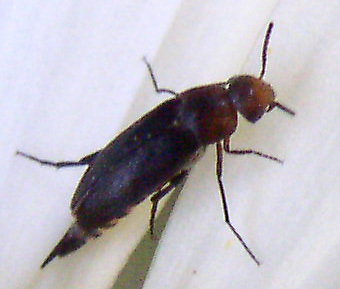 The wings are transparent, crossed by thin dark veins. There are four wings, two on each side of the thorax; but most of the time the back and front wing are joined by tiny hooks along the edges and look and act as one. Wings are a lot stronger than they appear and can carry the busy animal for several miles a day in its constant search for nectar and pollen; however, after several weeks of constant use they begin to fray along the far edge. 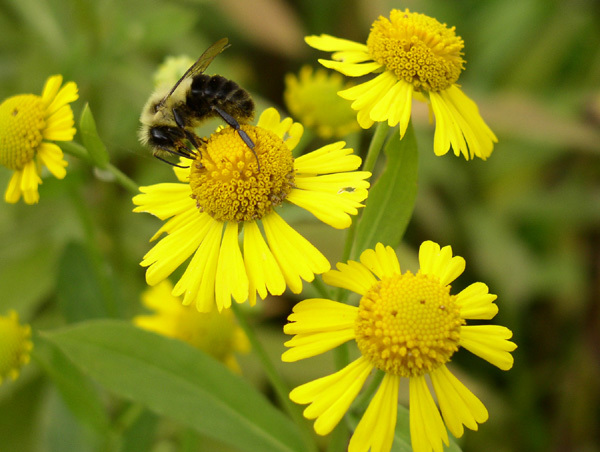 Look for bumblebees on flowers and after a while you will be able to tell the ones that are very young and look spanking new from the older, worn out ones. In early spring most of them are young and the opposite is true near the end of the season. We must be careful when we talk about bumble bees; at first sight we may think that they are all the same. 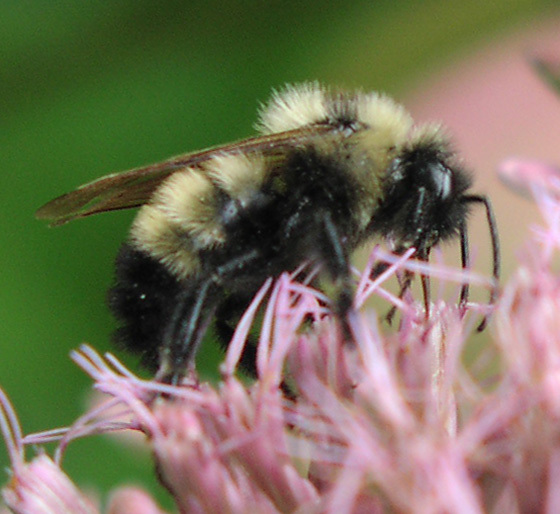 We may even make the mistake of assuming that the larger, glossier and blacker carpenter bees are also bumble bees. As we’ll see later they are not and they have a very different life style. 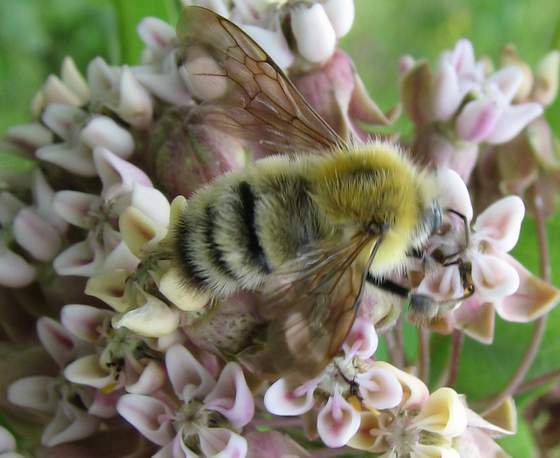 There are about fifty species of bumble bees in North America; it would be nice to tell them apart at a glance but in many cases the differences are very subtle and we need help from the experts. They will tell us that it can be very difficult and that they may need to examine the specimen carefully under the microscope before making a diagnosis. So we won’t worry too much about identifying the species all the time. 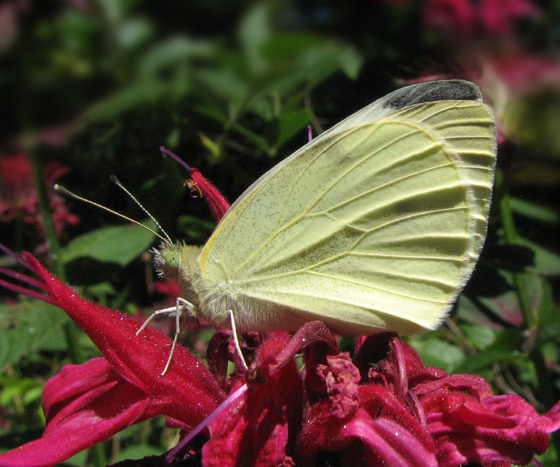 Some of the most common and easy to recognize butterflies are the whites and sulphurs. 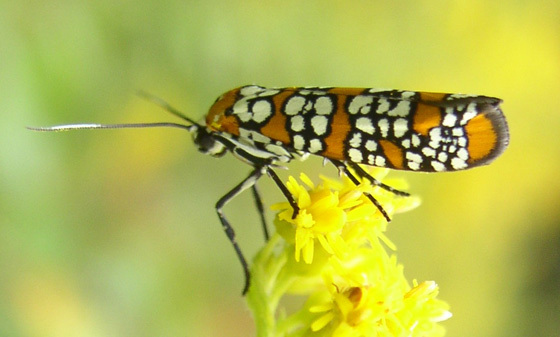 In fact the name butterfly probably comes from “butter colored flies” referring to some of the yellow ones. 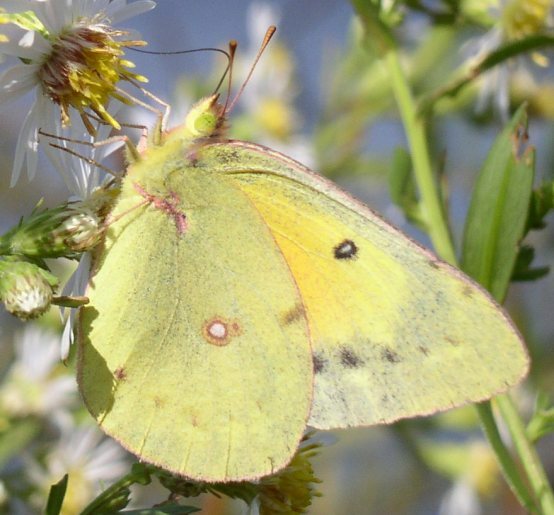 There are several variations, but most are white, like the Cabbage White butterfly, or yellow, like the Clouded Sulphur. The wings are roundish, some have orange or black tips and dots. 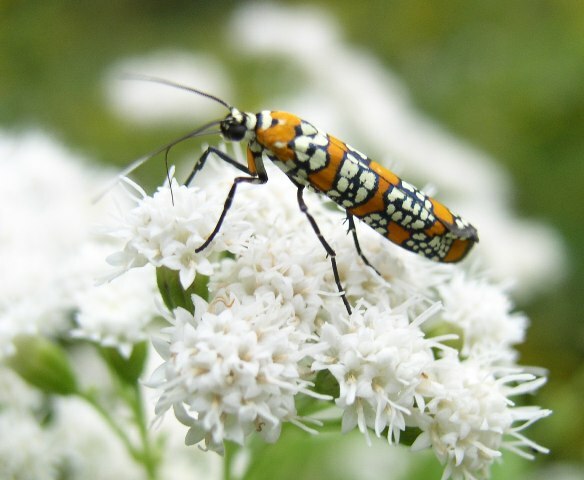 They are midsized butterflies with a wingspan of about an inch. Whites and sulphurs are found in every garden visiting flowers. They also like to gather in groups at mud puddles. They often can be seen chasing each other in a spiral flight, circling around each other while raising toward the sky, and then one of them dropping down. 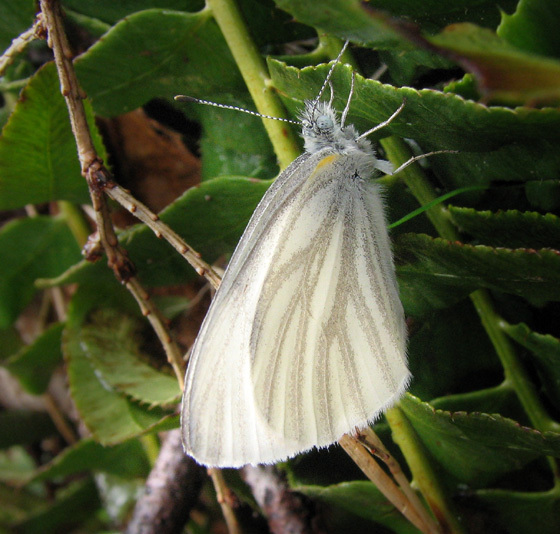 There are many native species, but the Cabbage White butterfly was introduced from Europe and, as its name suggests, it is a pest of cabbages and related plants. Habitat. Gardens, fields, open areas, from beaches to mountains. Season. From April to October, year round in southern states. Flowers. Long throated flowers: monarda, butterfly bush, butterfly weed, mints, clover and also flat open flowers: daisies, sunflower, dandelion, thistles, goldenrod, etc. Also, look for them at mud puddles. 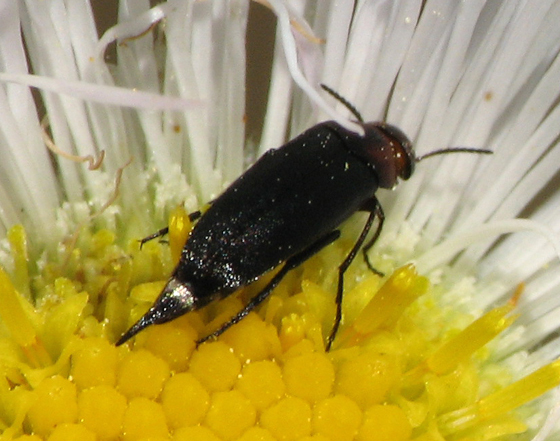 Tumbling flower beetles get their name from their habit of dropping from flowers tumbling down when molested. They are rather small, humpbacked and wedge shaped, their most striking feature is their pointy rear end, which causes the characteristic tumbling movement. Sometimes they are called pintail beetles. Most of them are black, but some have a reddish head or gray color and also other patterns. They are frequent flower visitors, but probably not very good pollinators. You are currently browsing the Polinizador's Blog blog archives for June, 2011.